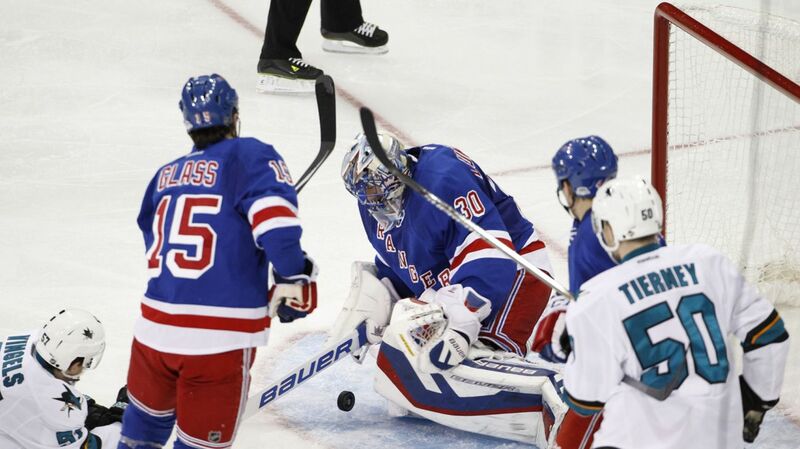 The Rangers had their most complete game of the season tonight, shutting out the San Jose Sharks by a score of 4-0. Photo courtesy of MSG Photos. Now this is the New York Rangers team that we were all waiting for. The Rangers handed the Sharks their first loss in regulation this season, as well as shutting them out, despite San Jose having 33 shots on net. Rick Nash continued his incredible streak of games, and scored his seventh goal of the season just 4 seconds after St. Louis scored his first of the season. And while centering the Rangers’ top line, Kevin Hayes found the back of the net for the first time in his career in the third period. The goal was unassisted. Lundqvist was stellar, and stopped all 33 shots he faced. Lundqvist has allowed 1 goal in the last two games he has played. The first period was pretty slow, and there was “not a lot of room to skate” as Vigneault described it. Both teams played pretty evenly, and had about the same amount of quality chances, which wasn’t many. 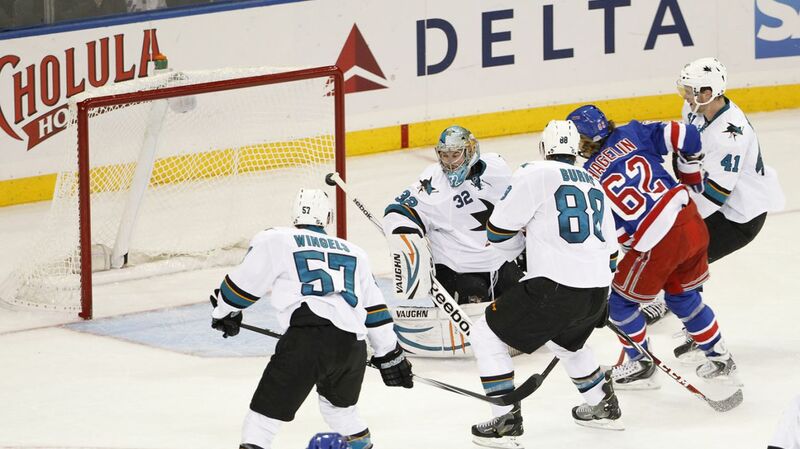 The shots in the first period was 7 for the Rangers, and 5 for the Sharks. The Sharks nearly got the first goal of the game just 6 minutes in. Sharks Defenseman Matt Nieto fired a slap shot at Lundqvist from inside the blue line. The puck trickled through Lundqvist’s pads, and was headed for the net, but Rangers defenseman Matt Hunwick came in and swiped the puck off of the goal line to keep the game scoreless. Matt Hunwick had the save of the game, stopping this shot from Sharks’ defenseman Matt Nieto on the goal line. Photo courtesy of MSG Photos. That play, which was obviously a great play, wound up being one of the most important plays of the game. If the puck went into the back of the net, the Sharks would have grabbed a very early lead, and could have taken the life out of the Rangers. 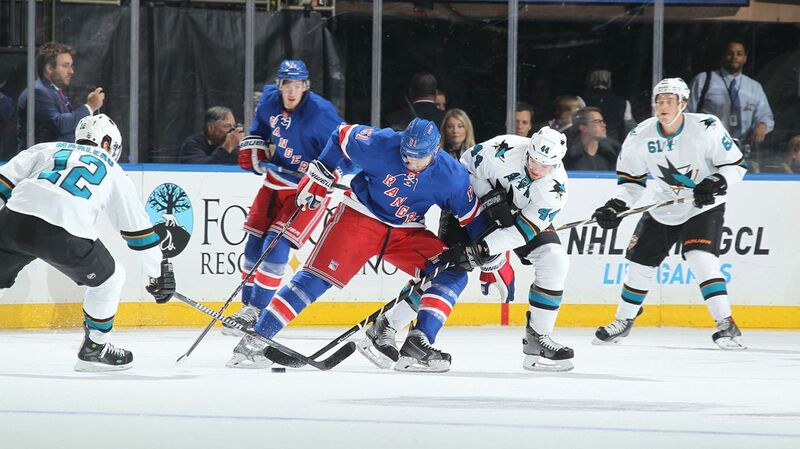 But instead, Hunwick cleared the puck, energized the crowd and the Rangers, and kept the game scoreless. Ryan Malone had a goal called back after review showed that the whistle had blown before the puck had crossed the line. Photo courtesy of MSG Photos. The only other notable chance came at the end of the first period. Ryan Malone pounded the puck from under Stalock’s pads and over the goal line in what looked like a good goal. But upon further review, the referees had blown the whistle before the puck crossed the line, taking away what looked like Malone’s first goal as a Ranger. Overall, the period was pretty quiet. It was also very physical, and people like Tanner Glass and Kevin Hayes, were hitting people all over the ice. The Rangers registered 15 hits in the first period alone. The second period was a complete turnaround for both teams. San Jose managed to have 15 shots on goal in the second period, and the Rangers had 17 shots. Offense was plenty in this period. The Rangers had a ton of chances this period, and moved the puck a lot more effectively. Martin St. Louis nearly connected on one early in the period, but rang it off of the top crossbar instead. After a lot of battling by the Rangers, the Blueshirts finally managed to put one on the scoreboard. After getting the puck at center, Carl Hagelin threw a shot towards Sharks goalie Alex Stalock. Stalock had trouble handling the rebound, and Hagelin, who never stopped skating, followed up his shot and chipped it into the back of the net to give New York a 1-0 lead 13 minutes into the period. It was his first goal of the season. Carl Hagelin beat Stalock on a second effort goal, his first of the season, and the Rangers’ first of the game. Photo courtesy of MSG Photos. 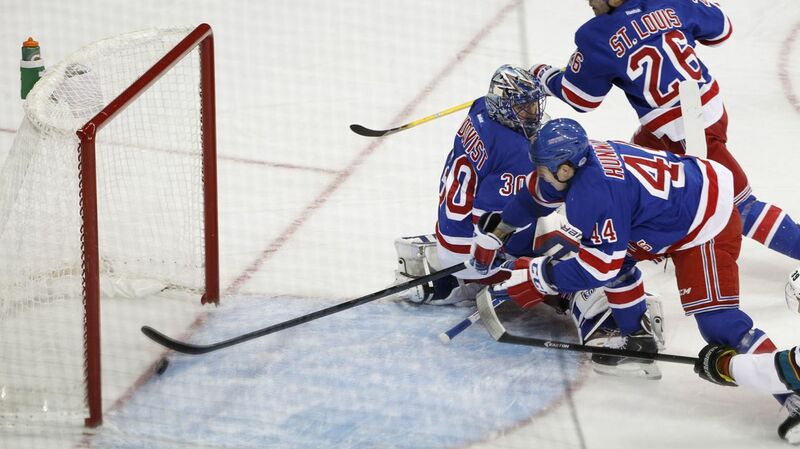 This was a goal that Hagelin desperately needed, especially after struggling in the first 5 games of the season. Hopefully this goal will give him some confidence and help him better his play throughout the season. The Rangers continued to apply the pressure, and scored again with less than a minute left in the second period. The Rangers won a battle against the boards, and when the puck came out in front of the net, Martin St. was there and smacked at the puck, eventually getting it past Stalock for the Rangers second goal. It was also St. Louis’ first goal of the season. When it looked like the Rangers would just finish out the period and head into the third with the lead, the NHL’s leading goalscorer Rick Nash managed to score his 7th goal of the season, just 4 seconds after St. Louis scored his goal. Who else but Nash? Rick Nash scored his league-leading seventh goal of the season, and it came only 4 seconds after Martin St. Louis scored his goal. Photo courtesy of MSG Photos. After Dominic Moore won the face off, Rick Nash took the puck and shot it towards Stalock. He tried to play the puck out to his teammates, but mishandled it. Rick Nash was able to get to the puck and slide it right through Stalock’s legs on a fantastic second effort goal. Nash now has 8 points on the season, and has scored in every single game if you count the shootout goal he scored against Carolina, which wound up winning it for New York. The Rangers headed into the third period with a three goal lead thanks to some great second effort goals by their skaters. The third period was much of the same, with both teams exchanging chances and hits. Tanner Glass wound up dropping the gloves with San Jose’s Andrew Desjardins following a cross checking penalty. Glass would head off to the box clapping, in what summarized the Rangers’ effort throughout the night. Perhaps the most memorable moment of the game came with 13 minutes to go in the third. Kevin Hayes made a great play on the forecheck to steal the puck from the Sharks’ Brent Burns. Hayes took the puck around the net and wristed one at Stalock, who stopped it with his left pad. Hayes followed up his own rebound and proceeded to shoot it right inside the post for his first career goal. 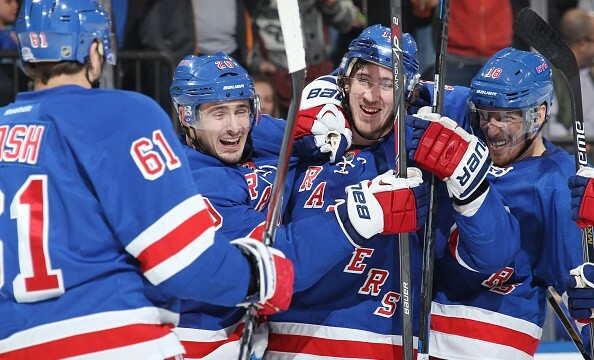 Kevin Hayes (third from the left) with a big grin after netting his first career NHL goal in the third period. Photo courtesy of MSG Photos. 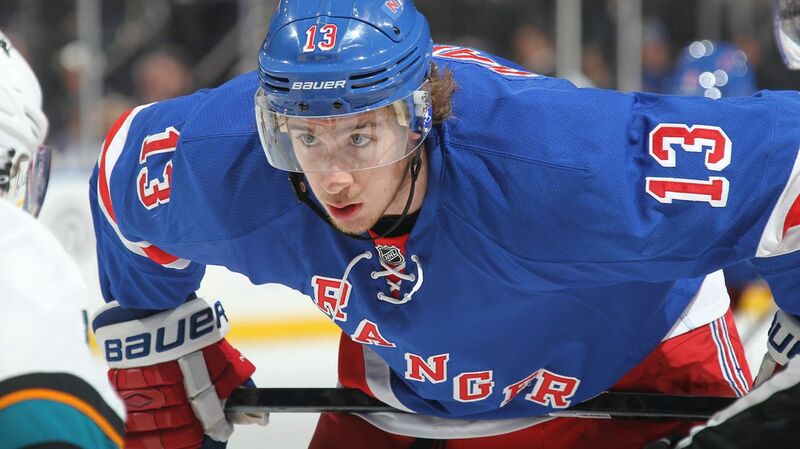 Kevin Hayes really deserved a goal, after another great effort from the 22 year old rookie. Hayes did a great job handling the top-line center role, and looked extremely comfortable in between Nash and Kreider. Nash also went over to the net to collect the puck for the rookie, which is surely something Hayes will always keep. Henrik Lundqvist also shifted into overdrive in the third period, as he was really motivated to earn the shutout. With San Jose on the power play with less than 6 minutes to go, Patrick Marleau got the puck on the far post, but wound up hitting the pipe as well as catching the glove of Lundqvist. Lundqvist making one of his 33 saves on the night, which added up to his first shutout of the season, and his 51st shutout as a Ranger. Photo courtesy of MSG Photos. The Rangers put on their best performance of the season, and have really rebounded since their two tough losses against Toronto and the Islanders. All aspects of the Rangers team has looked much better as of late. Alex Stalock struggled in net for San Jose. He had trouble controlling rebounds, which was his main problem. He stopped 25 of the 29 shots that he faced. Tonight was an eye opener for Matt Hunwick. After making the save on the goal line in the first to prevent the Sharks from scoring, he continued to play a great game, blocking shots and making some other great defensive plays to keep the game scoreless. Hunwick should definitely continue to be in the Rangers’ defensive pairings for the time being. Despite the pressure of centering the Rangers’ stars Rick Nash and Chris Kreider, Hayes handled the job well and looked very comfortable and effective on the ice. He also managed to score in the game. Photo courtesy of MSG Photos. Kevin Hayes had another good game. I feel like I’ve been mentioning him a lot, but it’s well deserved. Hayes has been excellent the past 3 games, and has been good with puck possession, is always in the proper position, and creates plays, like how he did in this game. He also provides size down the middle, which is something that can really help a team. Just ask the Kings. Rick Nash scored. Again. He is on fire, scoring his seventh goal in six games. He always seems to find the back of the net, and doesn’t need to be flashy to score goals. He is just able to score. He has also been great on the penalty kill and fore check. Nash also is hard to get off of the puck like Kevin Hayes has been doing. The top line for today was fantastic. Hayes centering Nash and Kreider worked very well, supplying offensive pressure, and giving the Rangers a line full of size. They played well together, and it’s a line that Vigneault should consider sticking with for a while. Henrik Lundqvist was “The King” tonight. Henrik made 33 saves and looked extremely sharp again tonight, controlling rebounds, using the pads and blockers effectively, as well as stopping Marleau late in the third. This was his first shutout of the season, and he adds to the franchise-record total of 51. It’s good to see Lundqvist rebound after struggling in the first two home games. The Rangers defense stepped up today, with the highlight being Hunwick’s save on the line. The Rangers did a great job clearing the crease of loose pucks and shutting down the passing and shooting lanes. Ryan McDonagh and the rest of the Rangers’ defense stepped up in front of Lundqvist tonight, and they all played their best game of the season. Photo courtesy of MSG Photos. Dan Girardi did not play most of the third period, after blocking a shot early in the period. 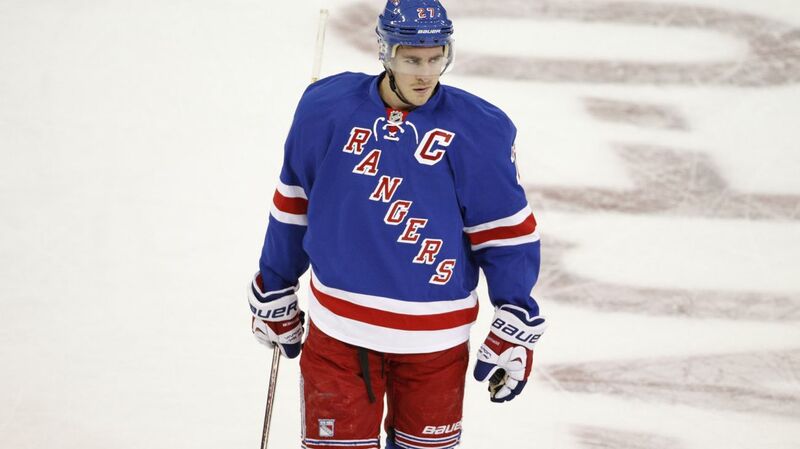 He received stitches to either his lower leg or his foot, and Vigneault said he is day to day. Kevin Klein also took a puck up high, and received stitches. AV also said he is day to day. The Rangers finally had a good night in the faceoff circle, winning 41 out of the possible 62 faceoffs. Derick Brassard won 13 out of 16 faceoff opportunities, and Dominic Moore won 15 out of 18 faceoffs. Moore also had 2 assists on the night. The win was a very good one for New York, defeating one of the top teams in the Western Conference and playing their “best game of the year yet” according to St. Louis. 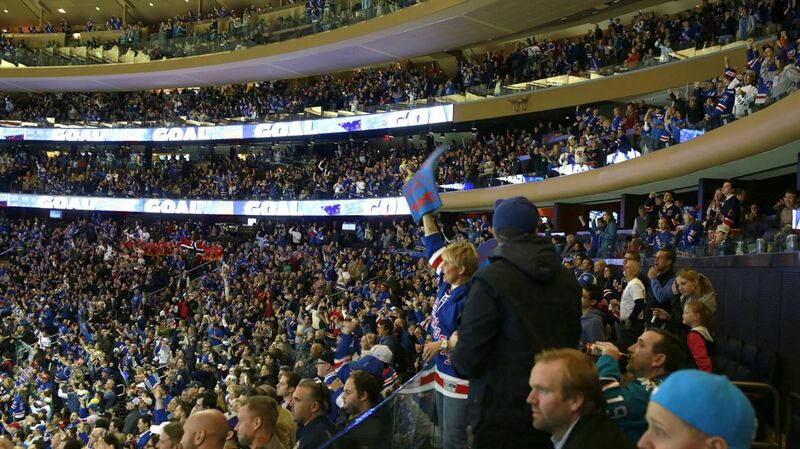 The Garden was rocking tonight, and the Rangers put on a great performance in front of the home crowd. Photo courtesy of MSG Photos. The Rangers will take on the division rival New Jersey Devils on Tuesday in Newark. This is the first time that the Rangers will be on the road in 4 games, and they will look to win their third straight. The Devils will be looking to rebound from a loss in their home opener against the Sharks. This should be a great game, as it is the first match up of the season between these two teams with a storied rivalry. Posted on October 20, 2014, in Game Recaps and tagged Anthony Duclair, Carl Hagelin, Chris Kreider, Chris Mueller, Dan Girardi, Derick Brassard, Henrik Lundqvist, Kevin Hayes, King Henrik, Madison Square Garden, Marc Staal, Martin St. Louis, Mats Zuccarello, Matt Hunwick, Michael Kostka, MSG, New Jersey Devils, New York Rangers, NHL, NHL 2014-2015 Season, NY Rangers, NYR, Rangers Nation, Rangers Season Opener, Rangerstown, Rick Nash, Ryan Malone, Ryan McDonagh, San Jose Sharks, The Duke, The Ranger Zone. Bookmark the permalink. Leave a comment.